Penshaw Hill and the nearby Worm Hill are closely associated with one of the North East’s best known folk tales; The Legend of the Lambton Worm. At the centre of this legend was a young lad called John Lambton who often used to skip church on Sunday mornings to go fishing. This particular Sunday was no different and off he went to fish the River Wear. After fishing all morning and not catching a thing he decided to pack up. As he was gathering his things together he noticed a tiny worm-like creature on the end of his rod, thinking nothing of it he tossed it down a nearby well and returned home for lunch. Several years later and the worm a distant and long forgotten memory John Lambton was a brave knight and crusader and had left England to fight in the Middle East. During his time fighting the tiny worm had began to grow ? it soon grew so big that it used to terrorise the local area feeding off the udders of cows and eating small children whole. It used to rest at the foot of Penshaw hill, wrapping its tail around the crest, this was where many attempts to slaughter the beast took place. Even after being chopped into many different pieces the worm would join back together and terrorise the area even more! After hearing of the events and feeling responsible for not catching it earlier John returned home to England. On his way back he consulted a wise witch who told him the only way to kill the beast would be by standing in the middle of the River Wear, wearing a suit of armour coated with blades of steel whilst waiting patiently for the worm to arrive. The witch also warned him that upon killing the worm, he must then kill the first living thing he set eyes upon otherwise a curse would be placed upon nine generations of the Lambtons so that none would die in their bed. John, obeying the words of the wise old witch put on the appropriate armor and instructed his father to send one of the family hounds to him, so he could complete the deed in accordance with her wishes and that no person should be needlessly killed. Making his way to the banks of the Wear he stood in the centre of the river, where he didn’t have to wait for long. The worm came darting towards him and proceeded to wrap itself around the armoured knight. After a short struggle the creature was gradually sliced up into many tiny pieces by the steel blades of Lambton’s armour. Bit by bit each piece of the worm was carried away by the current of the river before they had time to rejoin. At last the worm was dead. The victorious but exhausted Lambton, made his way back to the bank of the river, remembering that he must now kill the first living thing he set eyes upon. As he emerged from the river he looked up with shock and horror to see his excited father, who had evidently forgotten the hound. Lambton could not kill his own father and the Lambtons suffered the curse for the next nine generations. 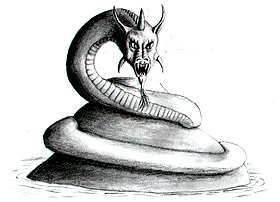 Several of the Lambtons met violent deaths or were struck down with illn ess but the worm never returned.